To ensure that you have found a competent bagpiper you should ALWAYS see and hear them play prior to booking! Nothing sounds worse than a poorly played bagpipe. Request a video as well as a sound file before you hire or you may be disappointed. Chris Apps is a professional Scottish bagpipe player in St Louis, Missouri. 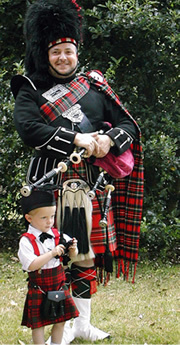 His beautiful bagpiping will enhance your special occasion like nothing else can. Whether your event is celebratory or poignant the emotions brought out by a well played highland bagpipe will add that special something. If you are hoping to hire a Scottish piper for your wedding, funeral, memorial service, business opening or back yard bbq Chris Apps will play the bagpipes with the professionalism you deserve. Chris has also been teaching Scottish highland bagpipes for over thirty years. He has been a certified bagpipe judge for over 15 years. Chris offers bagpipe lessons in the St Louis area for all levels of players from complete novice to Open competitive pipers. Chris is a bagpipe reed maker by trade. He is the proprietor of Chris Apps Reeds LLC in Union MO. Follow this link to view his many YouTube videos about bagpipe reeds.